Published on August 17, 2018 by Optics for Hire. As the use of lasers grows in application areas such as 3D depth mapping and laser cinema, a fundamental property of lasers called laser speckle has taken on greater importance. Entire companies have been launched to commercialize new approaches to reduce speckle noise. Laser Light Engines for example raised over $30 million development low speckle systems but was unable to reach commercial viability. Researchers and product developers wanting to combat speckle noise have a variety of options. 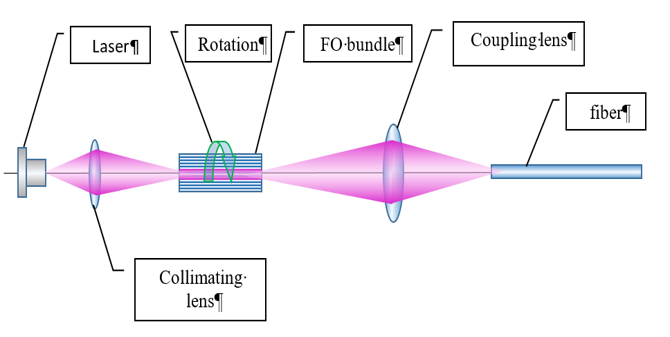 Optotune sells a widely distributed product ( Edmund Optics link ) for $635 and provides many options based on beam size, angle and wavelength. But there are other methods that can be employed, and here we demonstrate a technique we experimented with recently. A laser is focused on the end of a rigid fiber optic bundle, using a small motor we then rotate the fiber around the laser's optical axis. This provides mode mixing from the splitting of single point source ( laser) into multiple modes due to transfer through the fibers of fiber bundle (spatial coherence reduction) and due to rotation of bundle (temporal coherence reduction). Schematic of speckle reduction with fiber, note the coupling lens and secondary fiber are not included in the bench top prototype below. Below you can see the impact this mechanism has on the speckle noise, total optical losses were about 30% and the exit beam angle was 22 degrees. Right image, laser through fiber without rotation.